An Giang is a province in Vietnam that borders Cambodia. It is most popular for being the place where one finds Chau Doc. The city is situated at the intersection of a tributary linking the Bassac and Mekong Rivers. Chau Doc may be a little city, but what it lacks in size it makes up for in colors and is probably the only place where pastel colors are chosen to beautify storefronts. 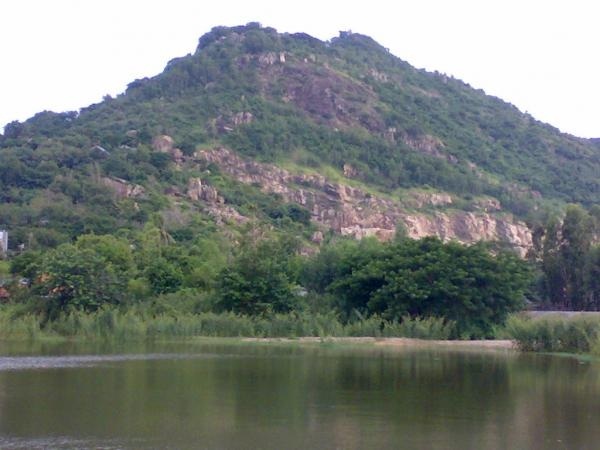 For tourists that want to travel in Chau Doc, Sam Mountain is always an attractive tourist spot. On the way there, you can enjoy the sights of the two rice fields along the road, and drop by for a short visit to a small Khmer village. You will have a short walk up on the mountain side to see the daily life of mountain people. 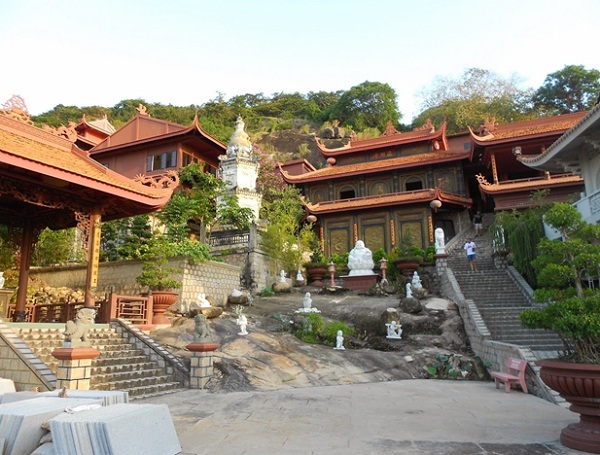 There are dozens of pagodas and temples, many of them set in caves, around Sam Mountain. Climbing the peak is the highlight of a visit to Sam Mountain. 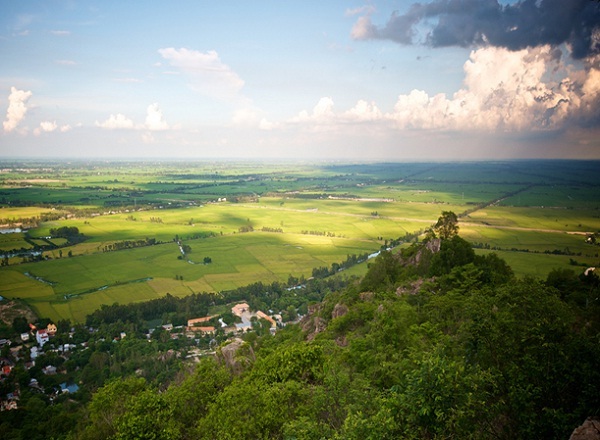 The views from the top are spectacular if weather permitting and you can easily look out over Cambodia. There is a military outpost on the summit, a legacy of the days when the Khmer Rouge made cross-border. The outpost is still functional and the soldiers are quite used to tourists taking photos now; however, you should ask permission and perhaps ply the soldiers with cigarettes before taking photos of them or anything that could be considered militarily sensitive. As you climb, you will pass massive boulders that seem embedded in the hillside, as well as some plaster statues of rhinos, elephants, zebras and a Tyrannosaurus rex near the top. From the top, the view of the surrounding, pancake-flat terrain is breathtaking, though the hill is, in fact, only 230 meters high. In the rainy season, the view is particularly spectacular, with lush paddy fields scored by hundreds of waterways, though in the dry season the barren landscape is hazy and less inspiring. There is a tiny military outpost at the summit, from which you can gaze into Cambodia on one side, Chau Doc on the other. Sam Mountain owns not only many beautiful landscapes but also several historical relics. So Sam Mountain is considered as the most attractive tourist spot in Chau Doc. A trip to Sam Mountain will help you to understand more about reliefs of the local.